Image Credit: Boom Technology, Inc.
XB-1 is the first independently developed supersonic jet and history’s fastest civil aircraft. It’s a one-third scale realization of the upcoming Boom supersonic passenger airliner, which will cut travel time in half. Erin Fisher, head of Flight Control Systems for Boom, recently spoke about the new aircraft at the Women in Aerospace Night hosted by Ball Aerospace in Broomfield, Colorado. “If it’s hard to get somewhere, very few people go,” Fisher said. For years, people looked at methods of transportation that would move us faster and faster. Covered wagons opened up travel to people, but it was generally only in one direction. Trains and railroads made it possible for people to travel to multiple destinations – and back again – but it was slow. Flight made travel faster, but it wasn’t until the first passenger jet was developed that people were able to travel from coast-to-coast in the United States in under twenty hours. Suddenly, business could be transacted in person and people had a quick and easy way to go on vacation. The next logical step was to take flight supersonic. Aircraft that fly at supersonic speeds are flying faster than the speed of sound – faster than 768 mph (1,236 kph) at sea level. These speeds are referred to by Mach numbers. The Mach number is the ratio of speed of the aircraft to the speed of sound and flight that is faster than Mach 1 to Mach 5 (5x the speed of sound) is considered supersonic. “With supersonic flight, New Zealand becomes as accessible as New York,” Fisher said. But the dream of supersonic flight has never been fully realized. Concorde was the most notable passenger airplane to travel at supersonic speeds. It could fly people from London to New York in less than 3 ½ hours, or about half the time it takes for typical airliners to fly the same distance. When Concorde was first introduced at the Paris Air Show in 1969, there was a lot of interest from airlines, but by the time the aircraft was fully developed, world events — including the 1973-74 stock market crash and the 1973 oil crisis — dampened sales. And Concorde had some inherent flaws, which made it less appealing than its subsonic counterparts: the Concorde required large amounts of fuel and it was designed to carry 100 passengers. Concorde had to charge $20,000 for a round-trip ticket in order to make any money, but the cost of a flight meant that only the extremely wealthy could afford to take advantage of it. Many of Concorde’s flights flew half-full. An added problem was that many countries opposed the noise generated by the sonic boom — the thunder-like noise created as the aircraft travels at supersonic speeds. As the plane travels through the air, air molecules are pushed aside and form a shock wave, similar to the wave created as a boat moves through water. The shock wave forms a cone of pressurized air and when the pressure is released, like the popping of a balloon, it creates a sonic boom. The U.S. moved to ban over-land supersonic flight because of the noise, but many analysts suggest that it was because the U.S. didn’t have its own entrant in the market. Boeing cancelled its rival supersonic transport program in 1971, and no other company took up charge. So in the first fifty years of aviation, there had been incredible progress in the advances of speed, but beginning in the 1960’s and 1970’s, airlines shifted their focus elsewhere. Instead of improving on speed, airlines looked at enlarging their planes and providing better in-flight entertainment and meals on subsonic flights. Eventually, there became little to differentiate one airline from another beyond the quality of the experience. 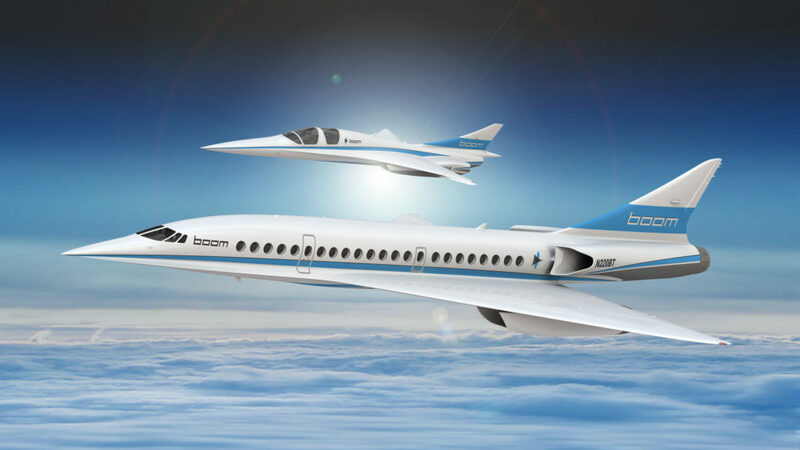 Now, Boom is inviting people to revisit the idea of supersonic flight. Leveraging 50 years of progress in fundamental aerospace technologies, they are designing an aircraft for efficient, affordable, and safe supersonic flight. The company’s Baby Boom aircraft is currently in development and will fly for the first time next year, proving out its technology before Boom begins work on its larger supersonic passenger aircraft. Boom plans to take on popular intercontinental business routes, while roughly matching current business-class fares for travelers. “What we’re doing at Boom is bringing back faster air travel, but in a more mainstream, more affordable way than Concorde,” said Blake Scholl, Boom’s founder and CEO. Boom jets feature major advances from Concorde, but do not require any new technology. Key components of the aircraft — including aerodynamics, propulsion and materials – benefit from advances that have been made since the Concorde was designed. For one thing, researchers can now simulate wind tunnel tests, in which air is moved over a vehicle as if it were flying. Wind tunnel testing helps researchers learn more about how the aircraft will fly and allows them to test new designs. In the past, every wind tunnel iteration would take about six months and cost millions of dollars, but today, you can do the equivalent of six months of testing in about thirty minutes with a simulation. Boom has run thousands of simulations. During the third week of July, Boom will run the final wind tunnel test before the company begins building the XB-1 Baby Boom aircraft. Wind tunnel testing helps refine the shape of the aircraft and the wing. The Concorde was a straight tube, but key technologies, such as composite fuselages, have recently been accepted by the FAA for commercial aircraft. Unlike traditional materials, carbon composites can be manufactured efficiently in almost any shape, allowing for the most fluid, aerodynamic design possible. Composites also handle the heat and stresses of supersonic flight better than aluminum. Other technologies also improve the design, including turbo fan engines, better environmental control, and increased fuel efficiency. Using these advances, Boom is building a modern supersonic airliner, aiming to enter service by 2023. Boom currently has 76 aircraft reserved. Virgin Group has an option for the first ten aircraft and will also help with supersonic testing. Although subsonic flight tests of Baby Boom will be conducted at the Centennial Airport near Denver next year, supersonic flight tests will be conducted at Edwards Air Force Base in Southern California, in partnership with Virgin Galactic’s The Spaceship Company. Once testing of the XB-1 design is complete, Boom will begin manufacturing and rigorous safety testing of its supersonic passenger airliner. Each plane will be configured with 45-55, single-aisle seats. Each passenger will have a large personal window, direct aisle access, and a dedicated overhead bin. Seat dimensions will be similar to short-haul first class and each seat will sell at business class fares. Boom jets have the ability to fly over land and then go supersonic over the ocean, so regardless of where they fly, travelers can expect a huge decrease in the amount of time spent in the air. Instead of taking 11 hours to travel from San Francisco to Tokyo, flights will be 5 hours 24 minutes. From LA to Sydney it currently takes 15 hours, but Boom will reduce that to 6 hours and 45 minutes. “And in the digital age, there really is no more distance, only time,” said Fisher. Focusing on routes that are mostly over water, Boom foresees 500 viable routes, but hopes that regulations will be changed in the future. “When people realize that they’ll be able to fly San Francisco to Tokyo in less time than San Francisco to New York, I expect people will think about that noise ban over land,” Fisher said. First independently developed supersonic jet. Previously, supersonic flight has been the province of governments and militaries. The XB-1 is the first independently developed and privately funded supersonic jet. Fastest Civil Aircraft Ever. Cruising at Mach 2.2 (1,451 mph), Boom jets are 10% faster than Concorde and 2.6x faster than other airliners. State of the Art, Proven Technology. Leveraging 50 years’ progress in fundamental aerospace technologies, Boom uses proven tech (aerodynamics, materials, propulsion) to create a revolutionary new design. While the design is new, every key technology has already been proven safe and reliable on other commercial aircraft. Premium Passenger Experience. With one spacious seat on each side of the aisle, each passenger has a large window, a personal overhead bin, and direct aisle access. Cruising up to 60,000′, passengers experience a smoother ride with less turbulence.